Breakfast on Black 2: It’s All About the People Stupid! The latest in our Breakfast on Black events took place last Friday, attended by an invited group of industry leaders with a passion for sustainable development. 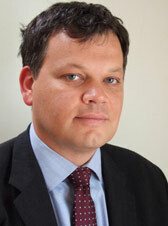 Our speaker this time was Miles Keeping, Head of Responsible Property Investment at Drivers Jonas Deloitte. Miles’ presentation focused on where value is created in sustainable development, focusing on the human factors and the role that buildings have on the productivity of their inhabitants. Miles kicked of by reviewing the plethora of legislation that has been passed to encourage energy savings in pursuit of the government’s target of an 80% reduction in carbon dioxide emissions by 2050. Buildings, both new and existing are a key sector as they currently account for about a third of the UK’s total emissions, but as Miles pointed out there have been some very mixed messages coming from the coalition government around encouraging sustainable development. He highlighted the weakening of the stance taken by HM Treasury, including the heavy cuts made to feed-in tariff’s and blocking the roll-out of Display Energy Certificates(DEC’s). If as promised this is to be the most sustainable government ever then they have a pretty strange way of showing it! In Miles’ opinion one of the most powerful drivers for occupiers to choose sustainable buildings is risk mitigation, whether that is from increasing energy cost, impact upon their brands from undesirable media coverage, or direct threats to continuity of trade caused by the impacts of climate change. He also identified a perceived link between buildings that fall into this category and increased productivity, but acknowledged that the evidence required to substantiate this claim is not yet available. I find this surprising, as there is research dating back to the 1990’s undertaken at Cardiff University which quantified a 16% reduction in absenteeism in low energy buildings when compared to air conditioned examples in similar locations. This is an area where our industry needs to undertake urgent research if we are to be able to prove the business case for sustainable development. Miles showed an interesting diagram showing the different factors of sustainable design, starting with location as the most important factor and moving out to water, waste and energy efficiency. 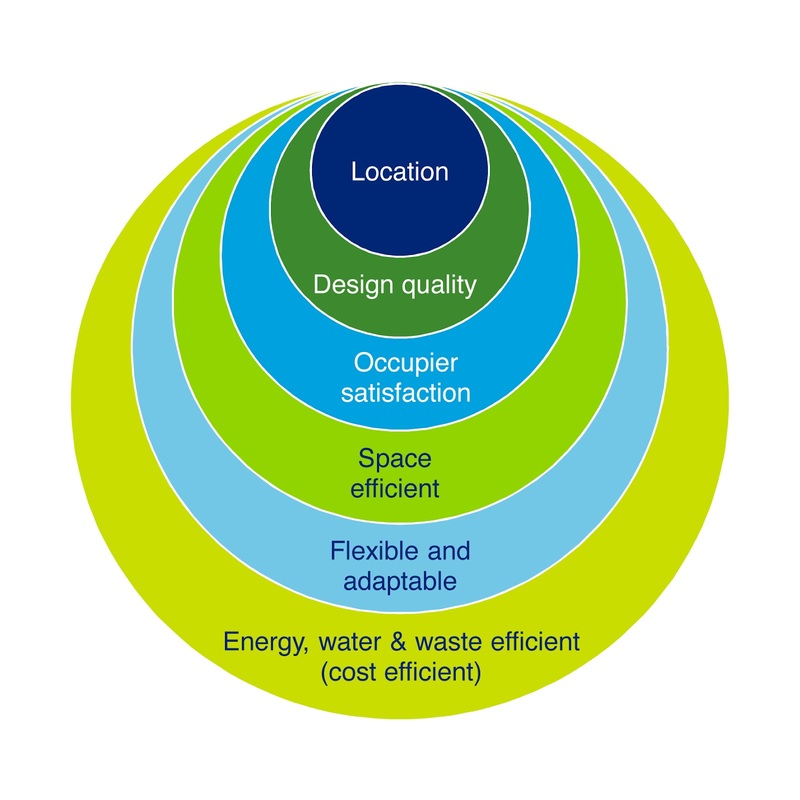 For me what was most telling about this diagram was that if you discount location as often being predetermined, then the most important factors are design quality, occupier satisfaction, spatial efficiency, flexibility and adaptability. These are all architectural concerns and they have the largest impact on the sustainability of the completed building. This highlights the critical importance of user centred design and the significant but often poorly addressed issues around the relationship between people who occupy buildings and the design philosophy that informs their creation. There is some strong evidence produced by the British Council of Offices (BCO) which demonstrates that occupiers see factors including energy performance and associated costs as factors which will be of growing importance over the next 10-20 years. In reviewing this data, Miles also identified that this study showed that low or zero carbon buildings will be areas to experience significant growth. What is most interesting is that there is no mention of the effects that building design has on the productivity of occupants. Is this because occupiers do not see this as relevant, or as I would suggest, that they simply were not asked? What is clear, is that if tenants prefer sustainable buildings, then these buildings are de-risked, making them safer investments and potentially worth more. The perception in the market, is that sustainable buildings offer greater resilience, are more effective and can offer organisations a competitive advantage. There is a growing belief that there may be a “green premium” and that this may also accelerate the rate of obsolescence of older, poorer performing stock. In combination these two factors may have a dramatic affect as investors move away from the old towards the new. Miles highlighted this trend with research from The Netherlands on the value of energy labels in the European office market that shows a rapid divergence between the value of green index and non-green index buildings. In conclusion Miles stated that there is increasingly compelling evidence to support a value shift in favour of more sustainable buildings and that this is associated with a perceived increase in risk associated with older, poorly performing stock. He posed the question “when will productivity become a valuation issue” and stated that there is still a lack of reliable data to prove the link between building design and productivity and that this is a real problem. I was left with the feeling that so far the industry has delivered only minor energy improvements and that these have been achieved by increasing cost. The crucial next phase is that we need to demonstrate how sustainability adds real and enduring value and this is all about the productivity of the people who occupy our buildings; or put another way, it is all about the people, stupid!